Latics stars won’t pay the penalty! 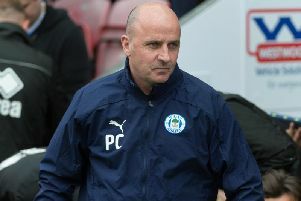 Wigan Athletic’s players have been getting some last-minute spot-kick practice ahead of tonight’s FA Cup second-round replay against Fylde – to avoid paying the penalty! With no second replay on the cards, there has to be a winner on the night – and assistant boss Leam Richardson admits Latics have been doing their homework if it goes all the way. “I think you’ve got to cover all bases wherever you can,” Richardson said. He also revealed the list of penalty takers would come from the players themselves, rather than handed down from the management. “I’m always a believer that a player has got to want to take a penalty,” Richardson added. “If you’re electing lads who don’t really want to take one, it’s never a good thing. Both Will Grigg and Nick Powell have scored from the spot this season, although it’s possible both will be rested for the game. That would open the door for the likes of Max Power, Lee Evans, Ivan Toney, Michael Jacobs, Gavin Massey and Gary Roberts to jostle for position.